സൂറിച്ച്: സ്വിറ്റ്സര്‍ലണ്ടിലെ സാമൂഹ്യ സാംസ്കാരിക പ്രമുഖ മാദ്ധ്യമപ്രവര്‍ത്തകനും മികച്ച സംഘാടകനുമായ ടോമി തൊണ്ടാംകുഴിയുടെ ഭാര്യ ജെസമ്മ തൊണ്ടാംകുഴി(48) ജൂലൈ ഒന്‍പതിന്(തിങ്കള്‍) രാത്രി 1.20 ന് കുറവിലങ്ങാട്ട് നിര്യാതയായി. 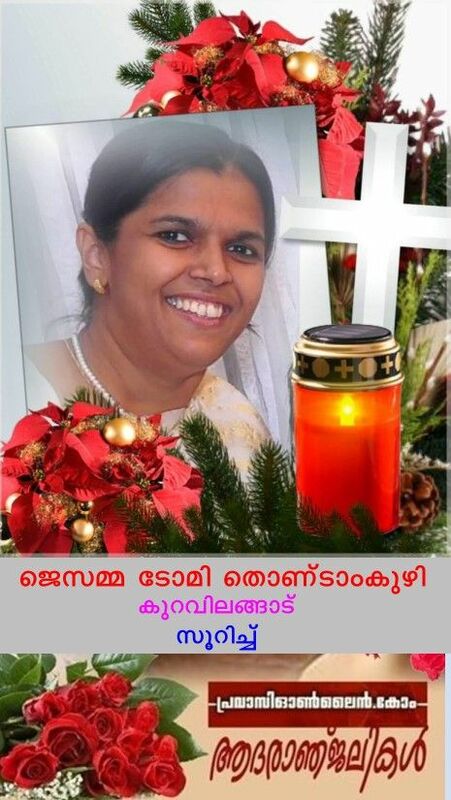 Keywords: Europe - Otta Nottathil - funeral_jessamma_thondamkuzhy Europe - Otta Nottathil - funeral_jessamma_thondamkuzhy,pravasi news,malayalam news portal,malayalam news from Europe,Gulf malayalam news,American malayalam news,Canadian malayalam news,Singapore malayalam news,Australia malayalam news,Newzealand malayalam news,Malayalees News Portal,Malayali News,News for Mallus,Finance, Education, Sports, Classifieds, Current Affairs, Special & Entertainment News. Classifieds include Real Estate, Condolence, Matrimonial, Job Vacancies, Buy & Sell of products and services, Greetings. Pravasi Lokam - pravasionline.com- a pravasi malayalam news portal. Malayalam Pravasi news from Europe,Gulf malayalam news,American malayalam news,Canadian malayalam news,Singapore malayalam news, Australia malayalam news,Newzealand malayalam news,Inda and other countries. Covers topics - News headlines, Finance, Education, Sports, Classifieds, Current Affairs, Special & Entertainment News. Classifieds include Real Estate, Condolence, Matrimonial, Job Vacancies, Buy & Sell of products and services, Greetings.